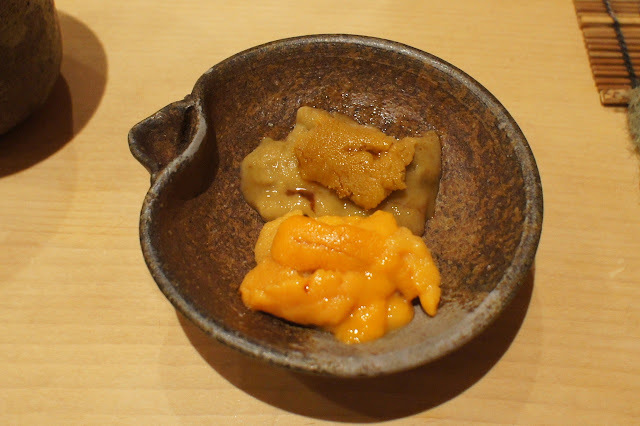 Sukiyabashi Jiro Roppongi is a 2-Michelin star Japanese sushi restaurant in Roppongi, Tokyo. It is the younger sibling of the Sukiyabashi Jiro Honten which has 3-stars and is helmed by the doyen, Chef Jiro. 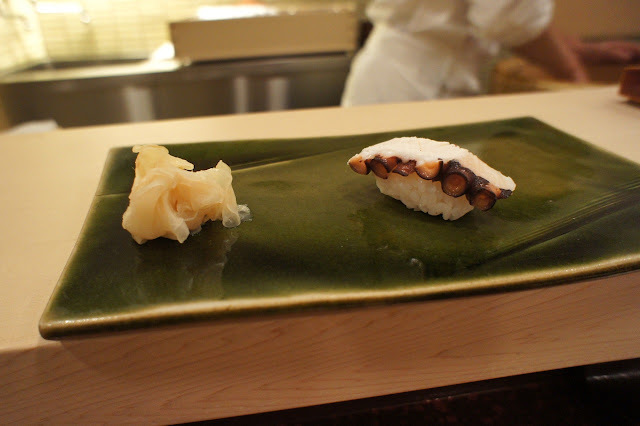 Roppongi is run by Chef Jiro's son. 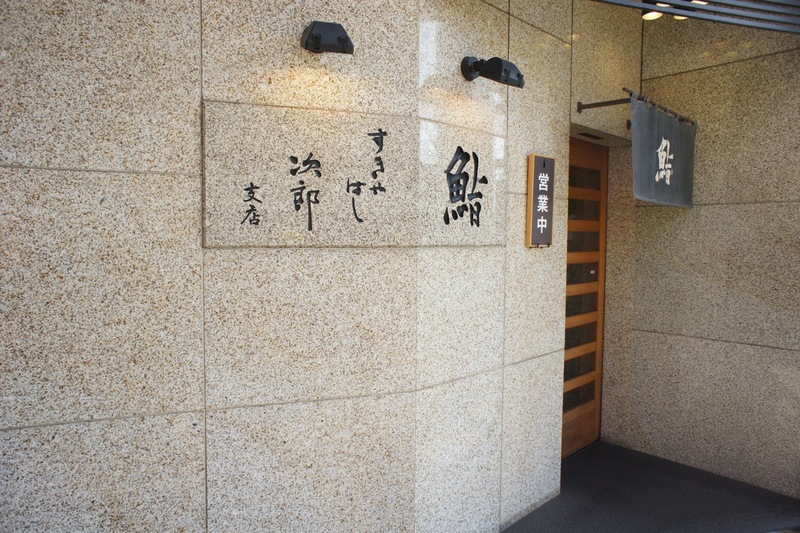 We had intended to dine at Honten, but unfortunately our hotel concierge informed us that Jiro refused to take our reservation as we did not speak Japanese (!! ), hence we were referred to Roppongi where they were more flexible. 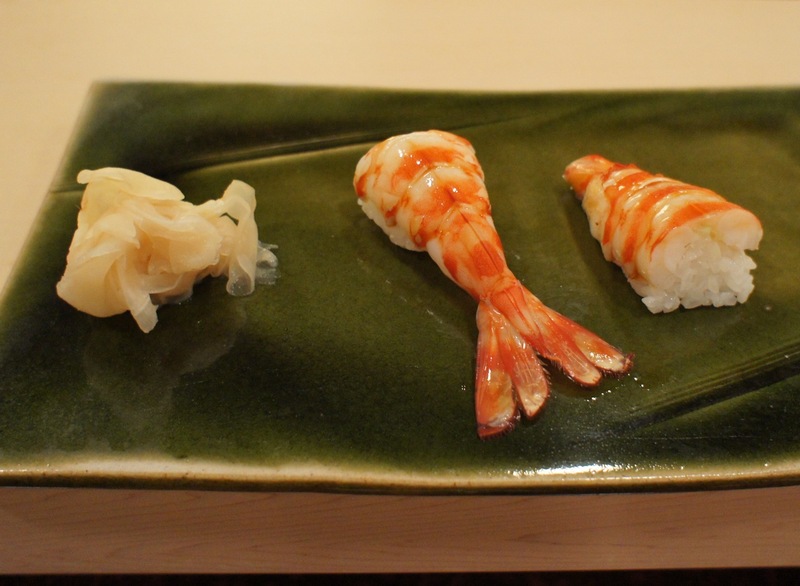 We were extremely annoyed by this. We have eaten countless times in Japan and elsewhere where we have not been able to communicate with the restaurant chef or staff but never had any problems. 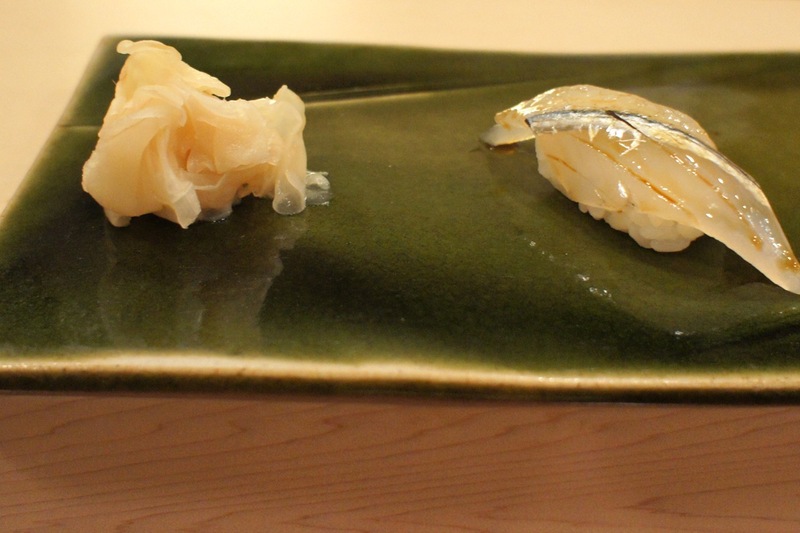 After all, we'd eat whatever was placed in front of us and then at the end of it they present us with a bill with figures on it which we could read, so we couldn't understand why Jiro would make an issue of it. 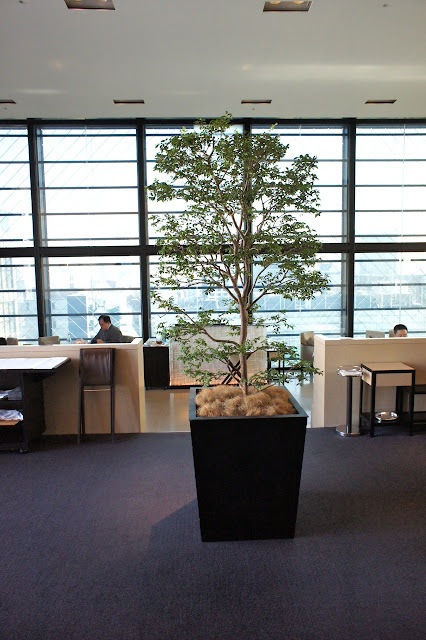 The branch in Roppongi is located opposite Roppongi Hills in an apartment complex, at a quiet corner. 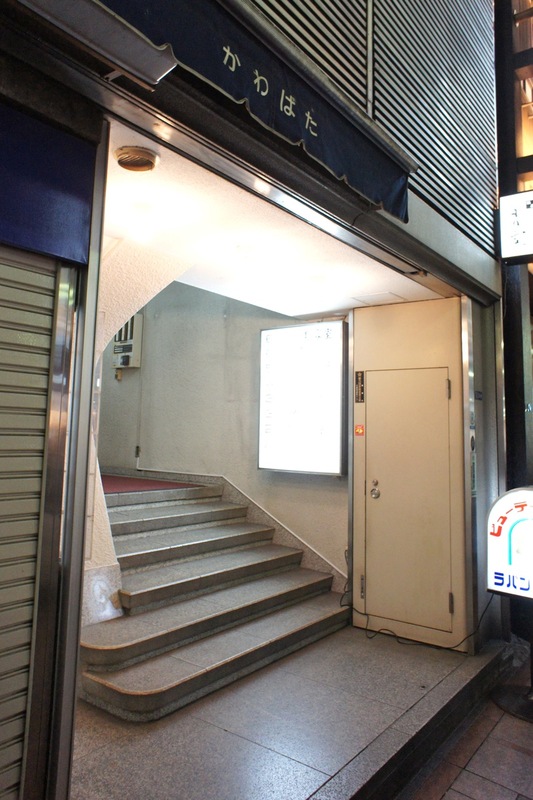 As usual, we couldn't make any sense of the unit numbers so had to walk around a bit to identify the place from the picture of the entrance which we had in our guide book. The restaurant was quite big by sushi restaurant standards in Tokyo, with a 10-11 seater counter and 2 four-seater tables (there could have been a private room, we are not sure). It was quite quiet with only another couple at the restaurant during lunchtime. 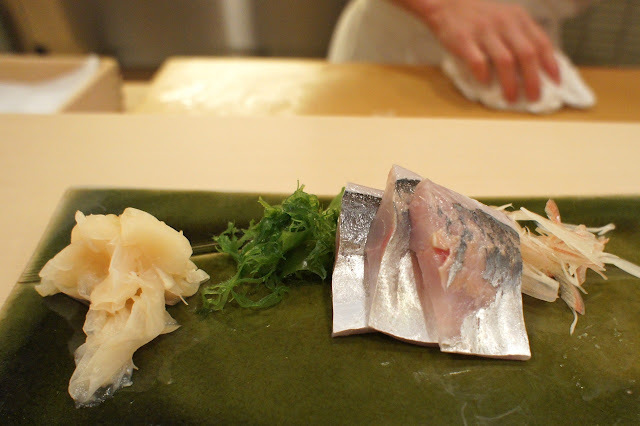 We were served at the counter by the Jiro's son, who runs this restaurant, and his young assistant. 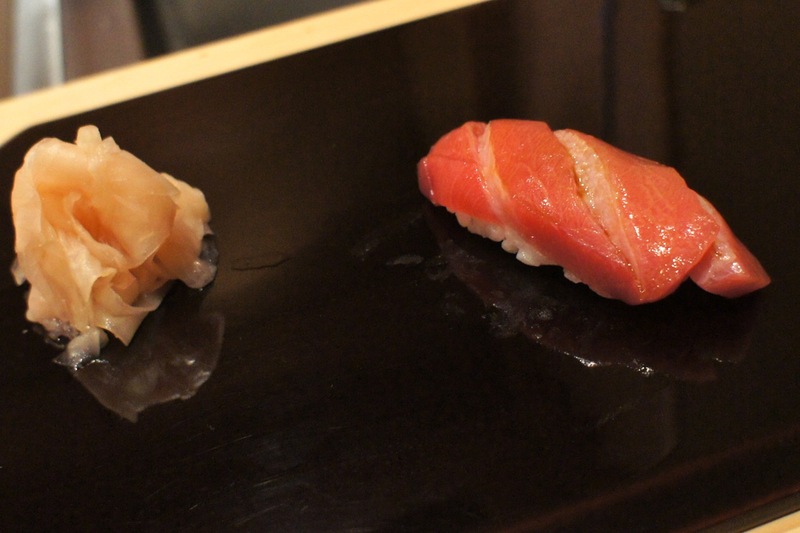 We started off with two dishes of very fresh sashimi (loved the mackerel), then it was straight to the sushi. 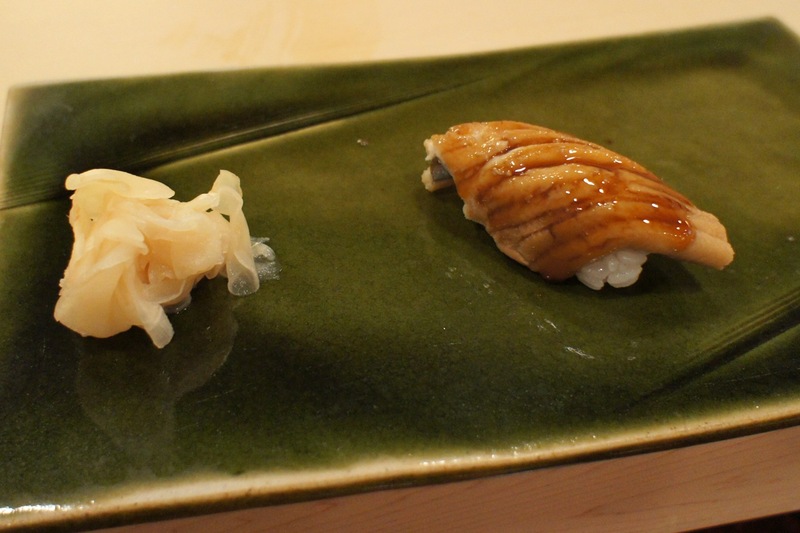 The style of sushi here was different to Harutaka, in that the rice was more vinegared and moist (unlike Harutaka which rice was whiter and more fluffy, different styles). 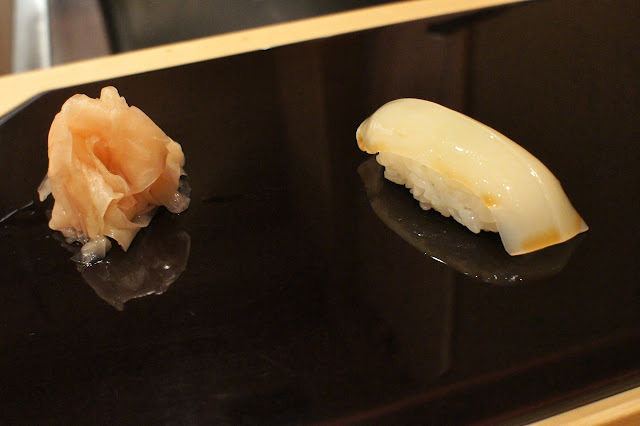 Each piece was excellent, and came out at a good pace (not too rushed, neither did we have to wait long for the next one). 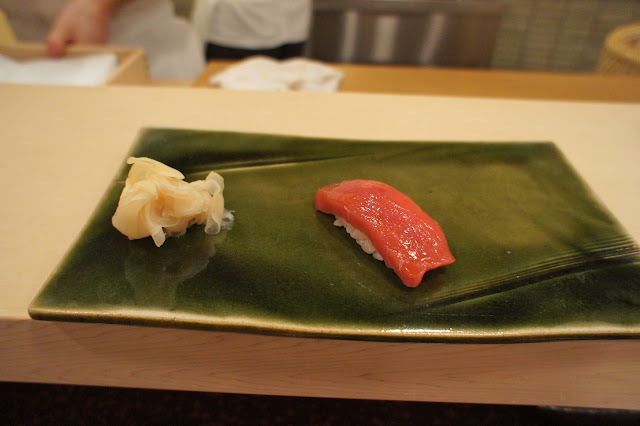 The sushi at a top restaurant such as this (and Harutaka) may not look to be much different from those you can get at any regular japanese restaurant, but in reality the quality of the ingredients and technique far outstrip the ordinary restaurants. 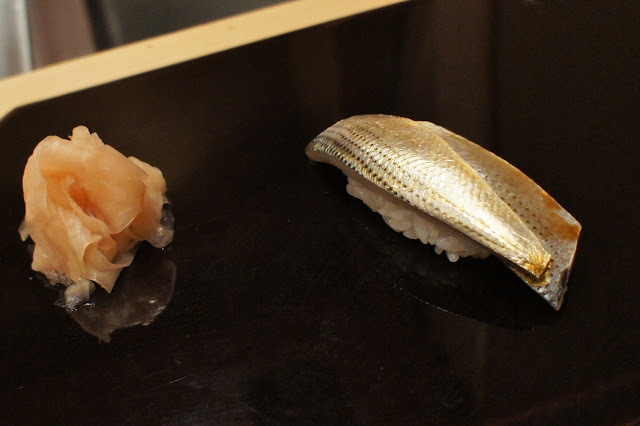 The way each grain of rice is prepared and marinated, the way the sushi is pressed together (unlikely to have half the chunk of the rice falling off when you are picking it up), the freshness of the fish which is often taken for granted, and very importantly the way the fish is sliced (this is commonly overlooked, as the slicing of the raw fish is critical to the sushi tasting the way it does), bear testament to the highest standards that these chefs aspire to. 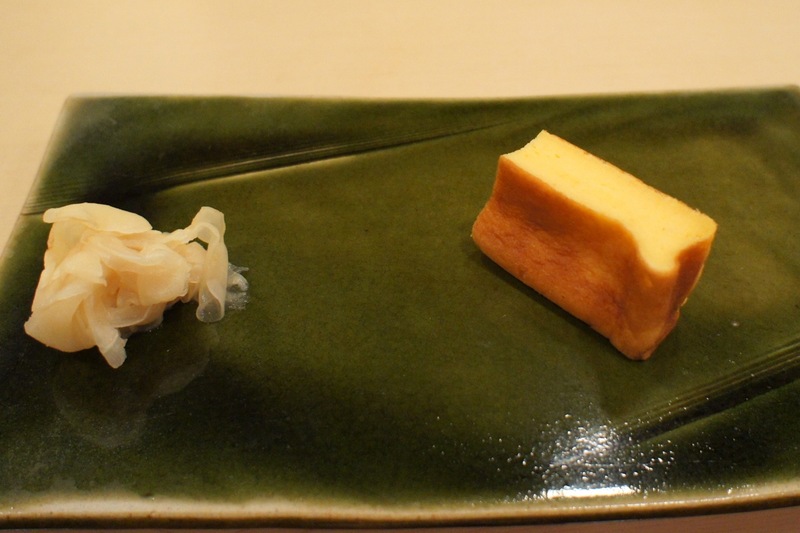 To end of the meal, we had their famous tamago (egg) which was unlike any tamago we have had. 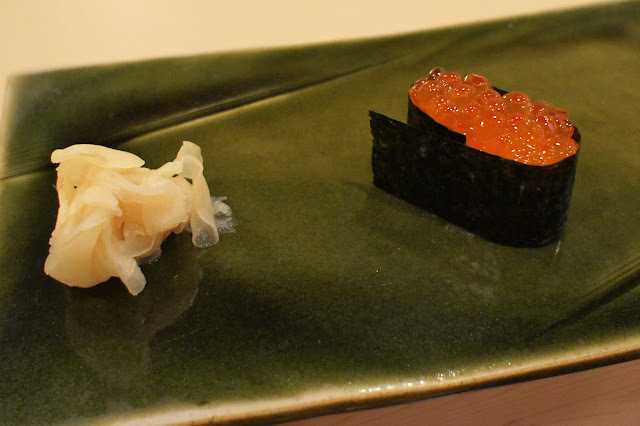 It was light and spongy, and a fitting end to a subtle yet exceptional sushi meal. 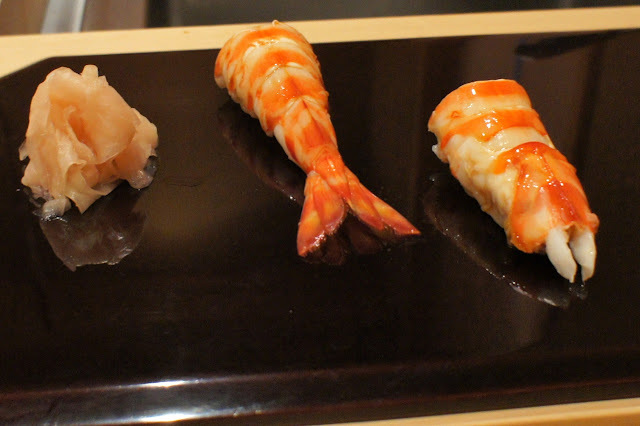 It was a very expensive meal (as these top sushi restaurants are in Japan), but for people who love their sushi, this would be as good as it gets. 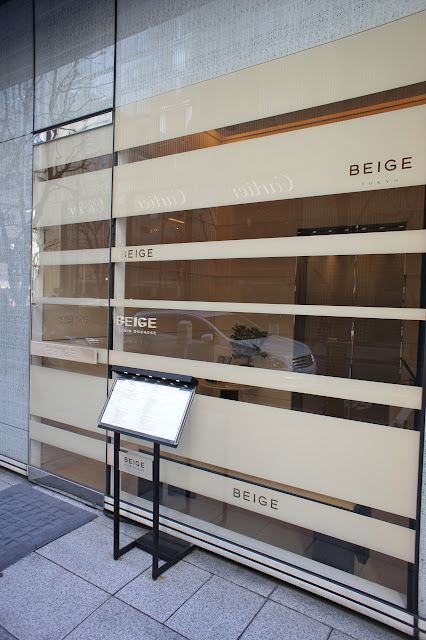 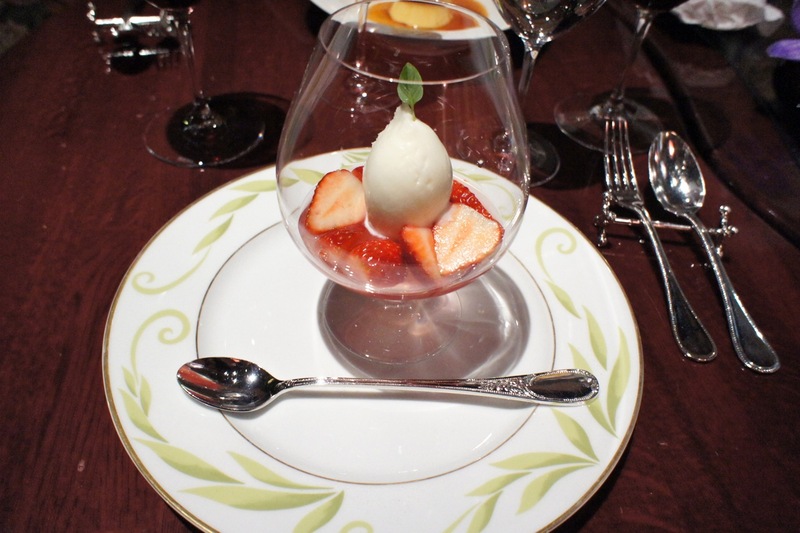 Beige is a 1-Michelin star french restaurant on the top floor of the Chanel main store in Ginza, Tokyo. 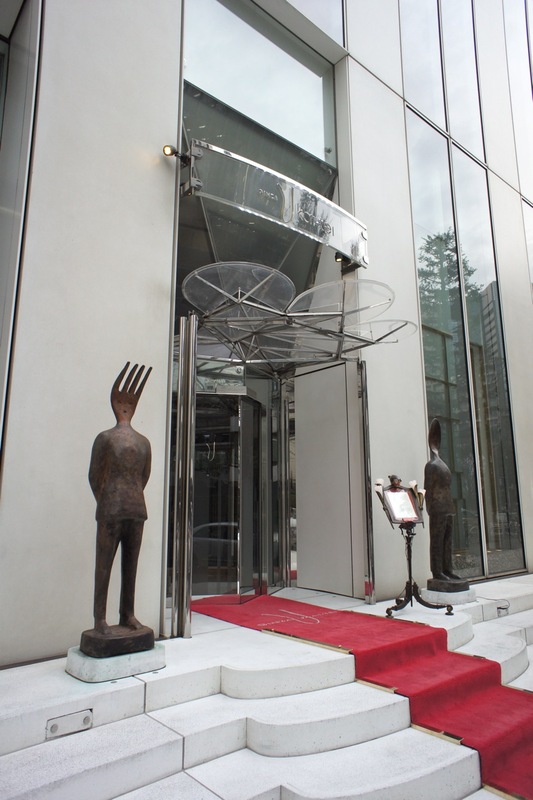 The discreet entrance can be found along the sidestreet from the main Ginza street on which the Chanel building is located. As this was a collaboration between Chanel and Ducasse (who has not had a great track record opening up restaurants outside UK/Europe), we were worried that this would be a snooty style-over-substance establishment which would charge a bomb to give you the opportunity to be seen. Fortunately, this would turn out not to be case. We were welcomed and led up an elevator to the 10th floor, where our jackets were taken and we were seated ot a table next to the window overlooking the main Ginza street below. 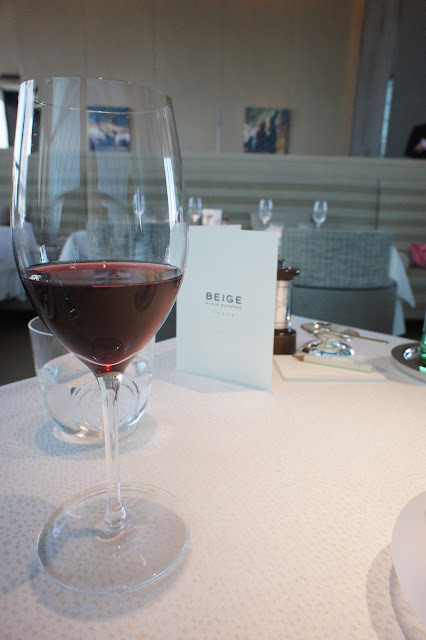 The dining room is very tastefully done, with a high ceiling, a smattering of artworks on the wall and seats made out of the instantly recognisable Chanel signature tweed beige comb fabric. 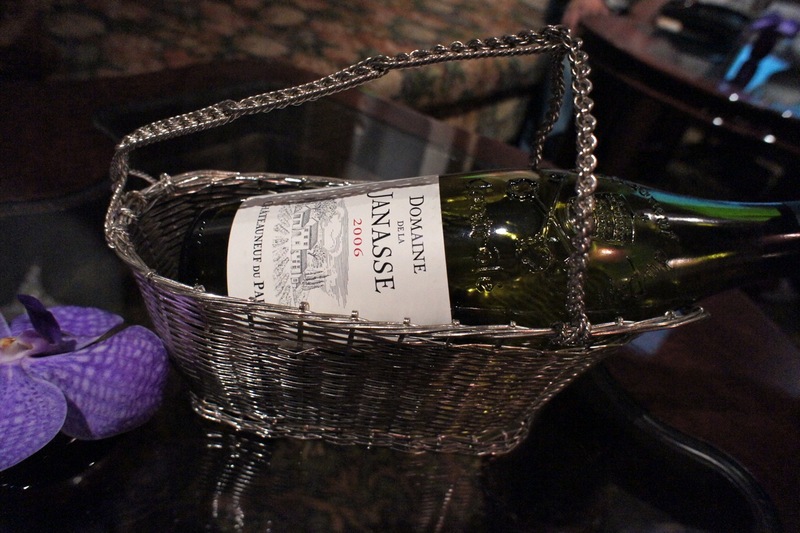 After we were seated, we were served with champagne and very familiar looking cheese puffs. 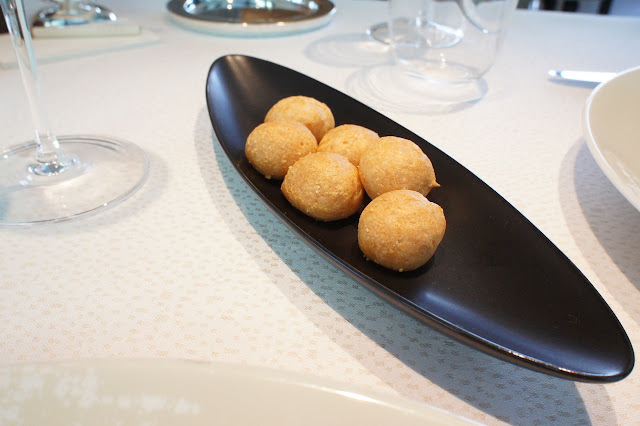 Ducasse still does the best cheese puffs. 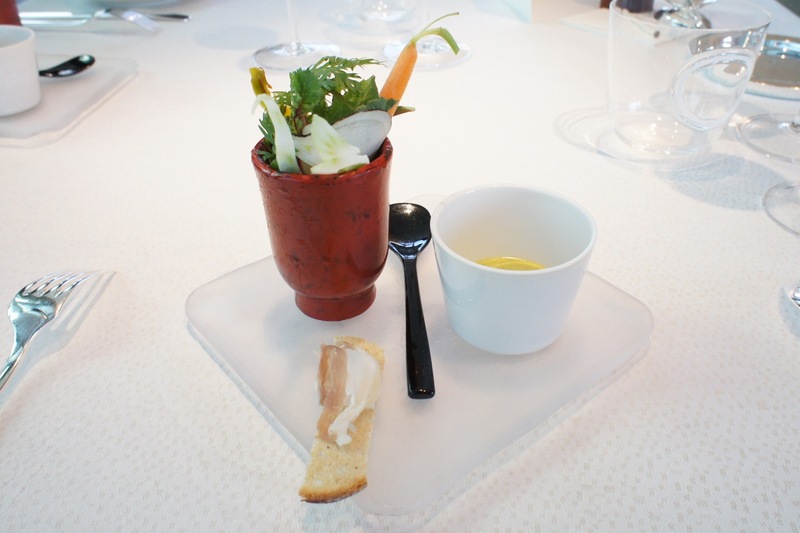 We went with the Menu de Chef, which was 5 course lunch set, starting with an amuse bouche of garden vegetables sitting in a cup of tomato jelly and broccoli foam, with a mayonnaise dip for the raw vegetables. 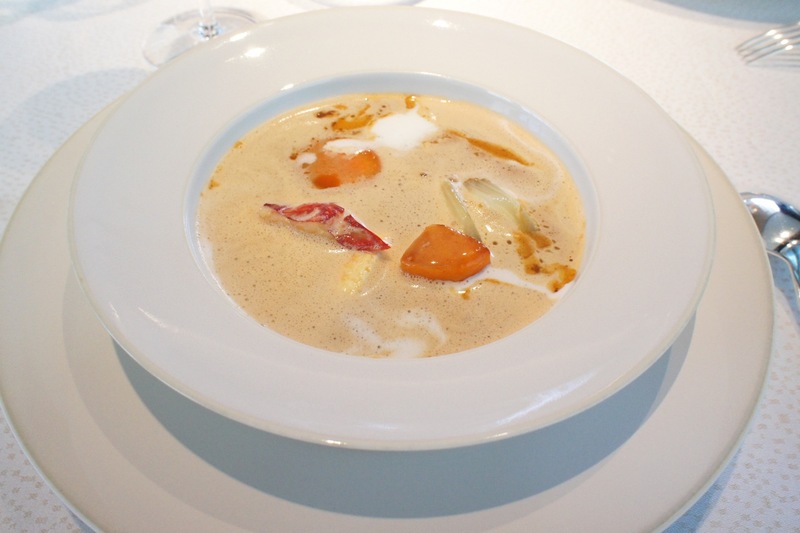 The next dish was the lobster bisque with lobster chunks and vegetables, which was very good. 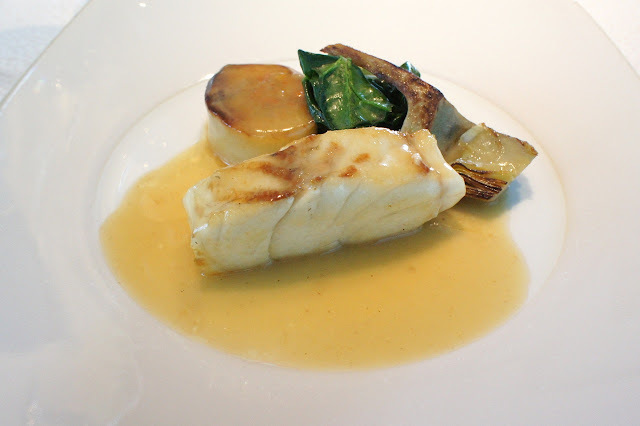 The baked seabass was next, and this was also excellently cooked, with a classical butter sauce. 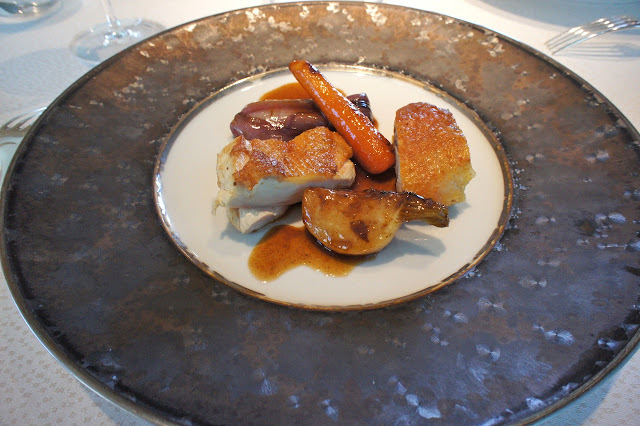 Finally, the main course was the roast chicken which tasted not unlike the Chinese-style crispy chicken, except that instead of the usual salt complement, the red wine sauce gave it the savoury taste. 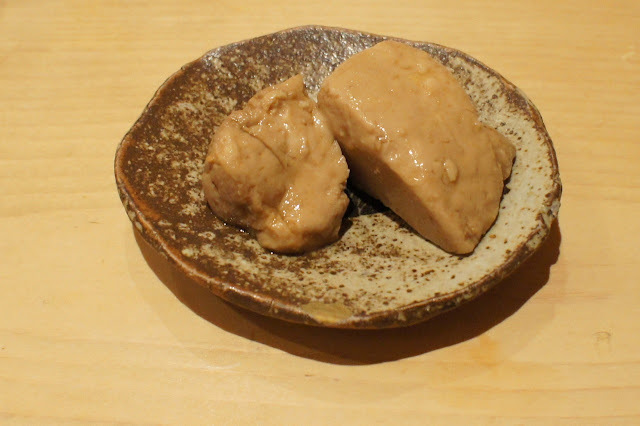 The chicken was cooked to perfection and was tender and juicy. 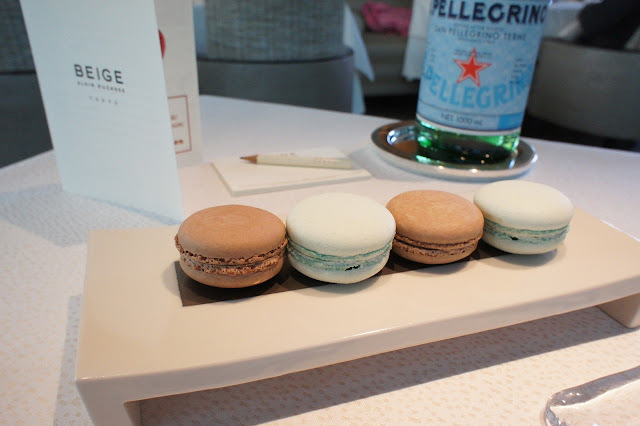 Pre-dessert was a tray of macarons; chocolate and pistachio flavours. For desserts, my wife had the Napoleon with vanilla from Tahiti (vanilla millefeuille) and I chose the signature carre-Chanel chocolate-praline with hazelnut ice-cream. 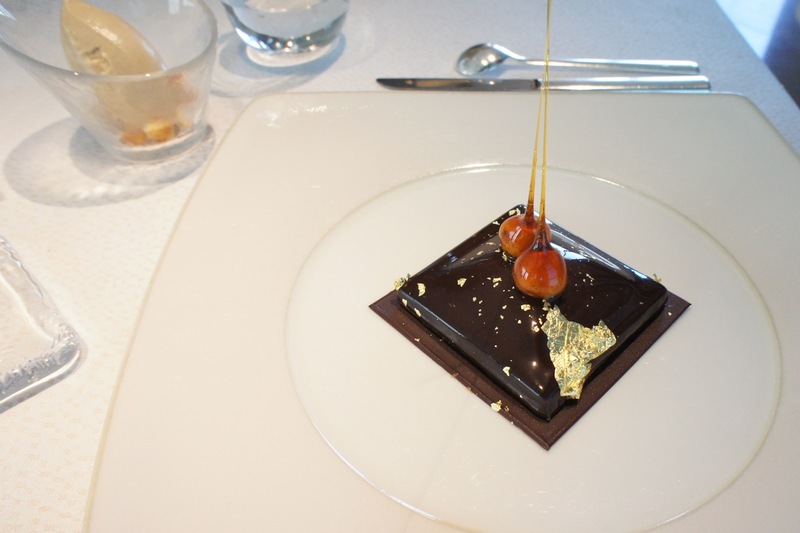 The Chanel chocolate dessert was superb, and tasted as good as it looked. 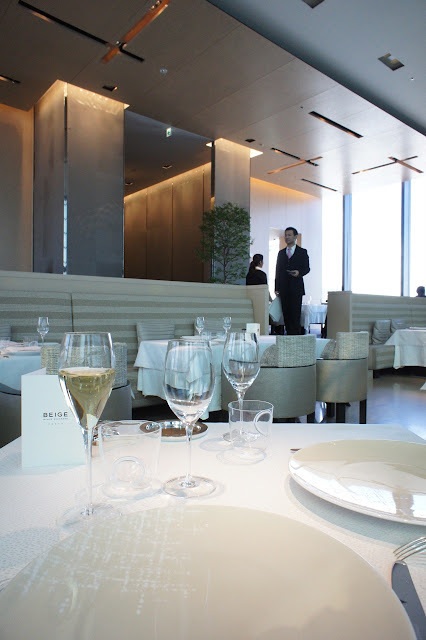 This restaurant oozes style (as can be expected as this is a Chanel co-owned restaurant in the Chanel store). 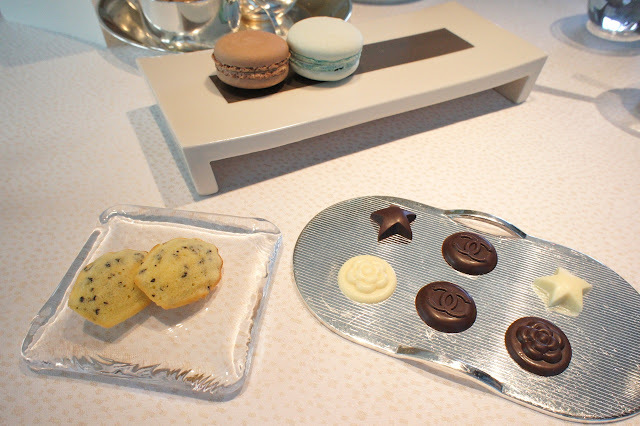 Even the petit four chocolates had Chanel logos imprinted on them. 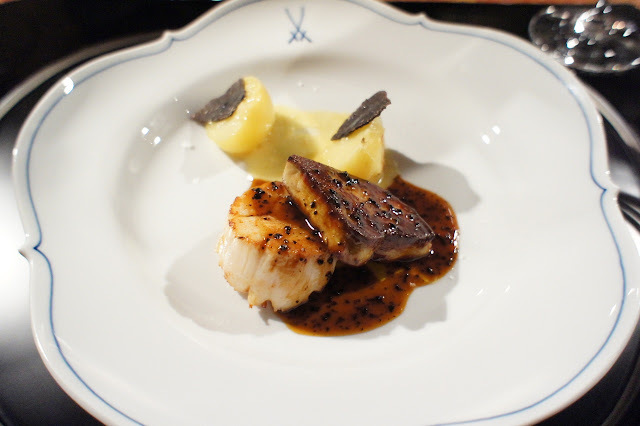 However, to its credit, it did not lack substance as well, as the food was consistently good and service impeccable. 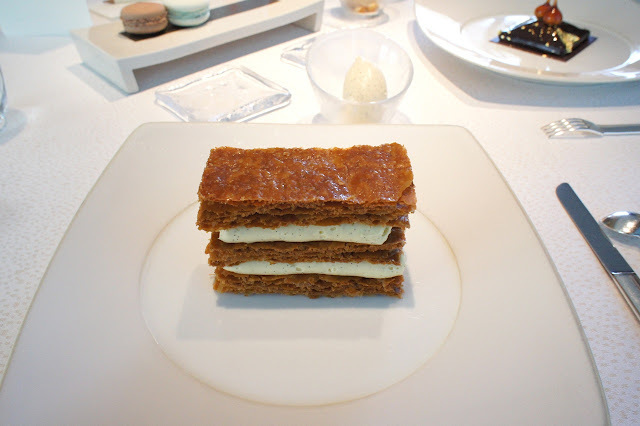 The main courses reminded us very much of the food at Ducasse in London (see earlier review: Alain Ducasse at Dorchester) in its execution. 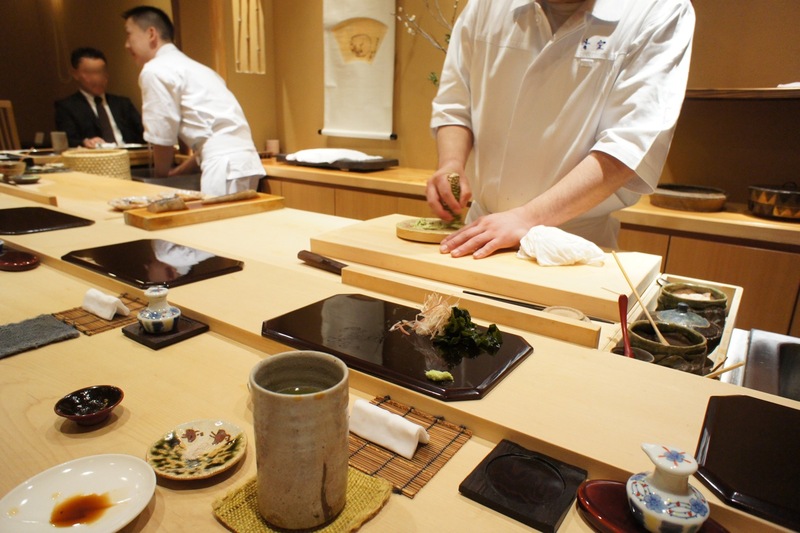 Harutaka is a 2-Michelin star Japanese sushi restaurant along the Ginza strip in Tokyo. 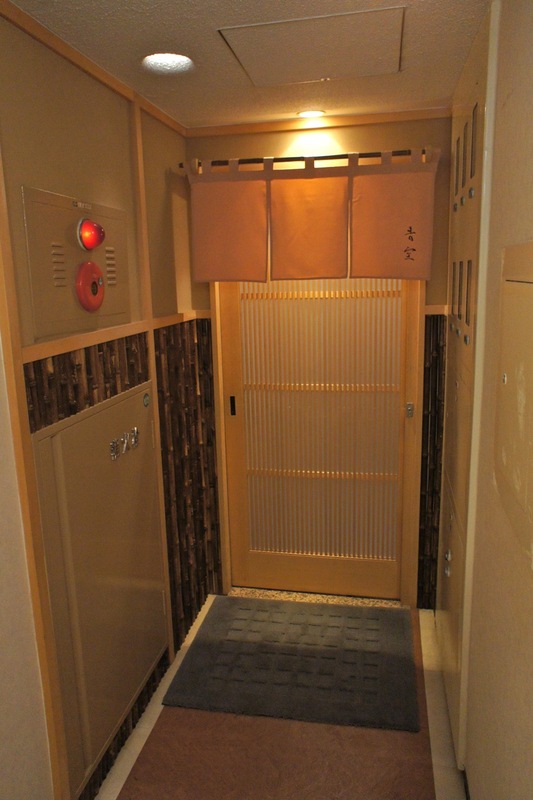 It can be found on the third floor of a rather discreet-looking building in one of the side streets of Ginza, one floor above a 'club' where loud singing by drunken men could be heard from the lift lobby. 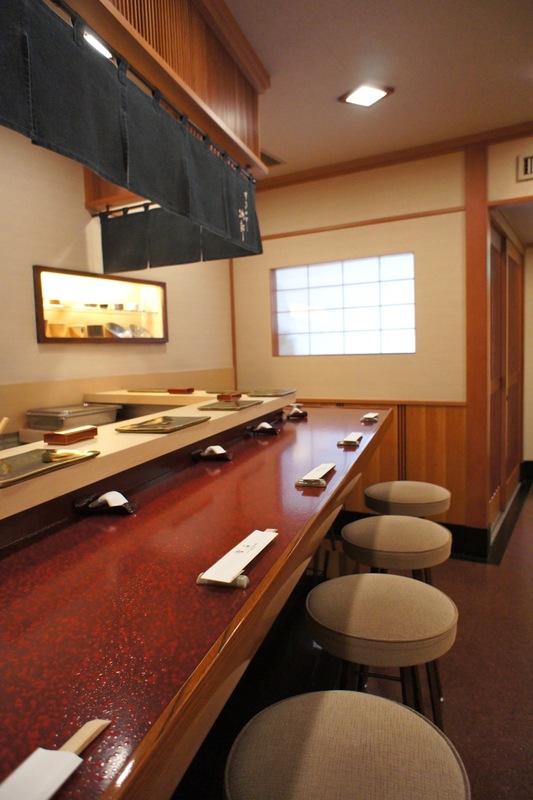 We were seated at a counter (which could sit 9 to 10 persons) by the corner. 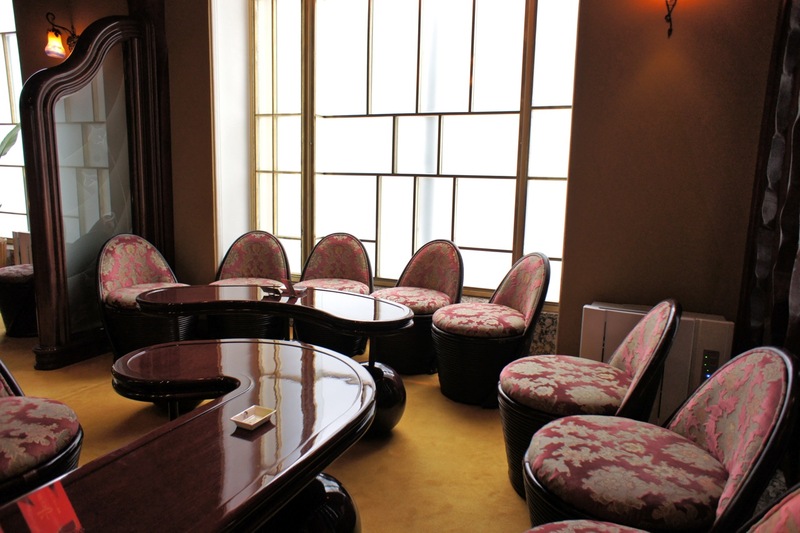 There is a private room which looked like it could seat 6 persons. The chef could speak some English and after ascertaining that we could eat anything and would have both sashimi and sushi, he proceeded to serve up the dishes. 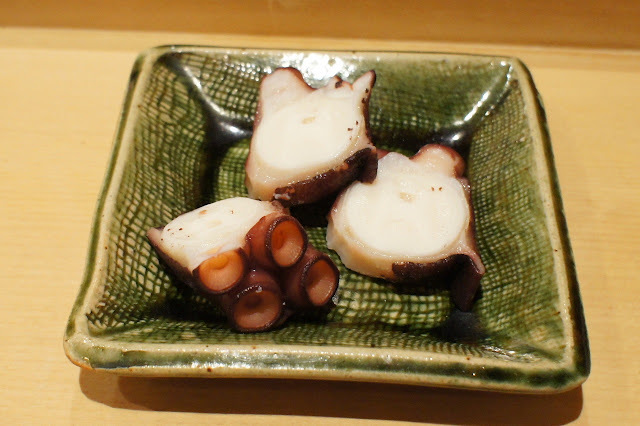 We started with some excellent grilled octopus tentacles, steamed abalone, raw trout as well as some other lightly seared sashimi. Then we were served a dubious looking dish of something which looked like intestines but tasted eggy (it was actually delicious). 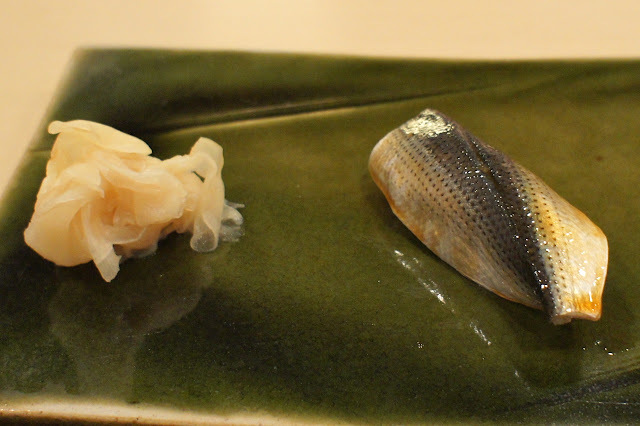 The chef watched us with a barely supressed smile while we ate it, and after badgering him to tell us what it was, he revealed that it was 'fish eggs' (though we though it was probably fish sperm sack or something else more funky). 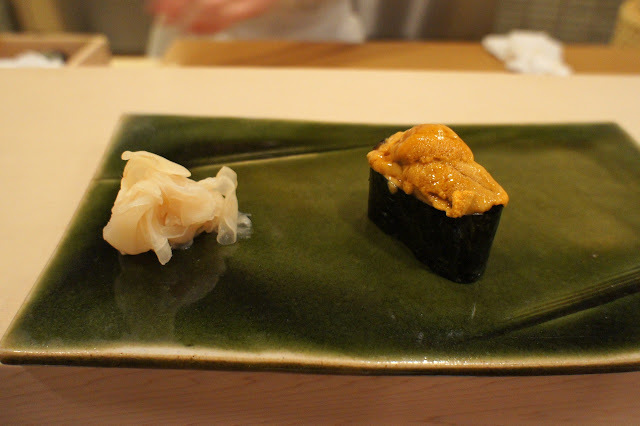 Next was fish liver which tasted like it was supposed to, then a dish of two types of uni (sea urchin) which were as fresh as you could imagine. 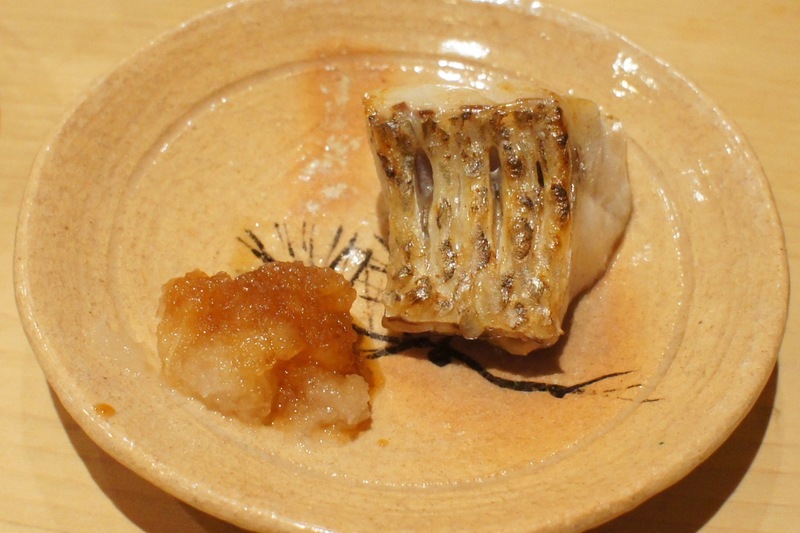 Finally, we each had a slice of grilled mackeral which was succulently prepared. 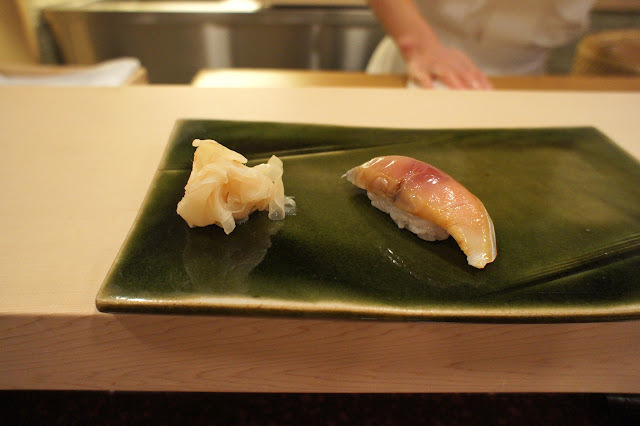 A change of tableware was then followed by the sushi. 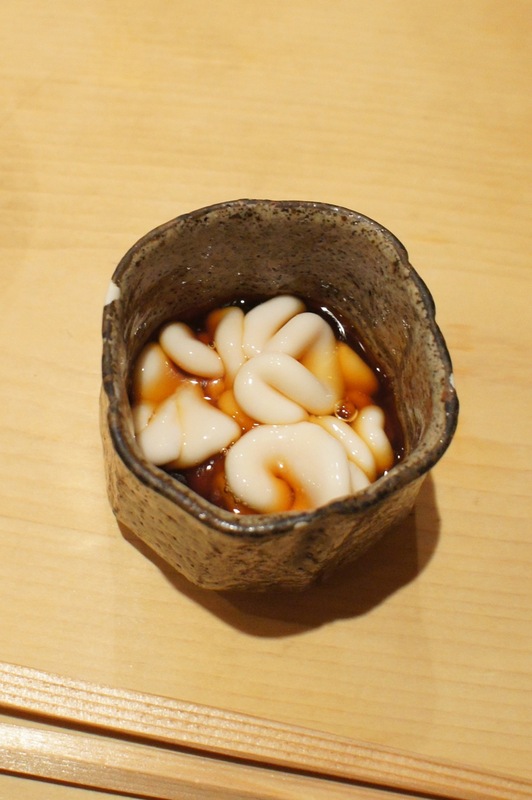 This restaurant is unique for it's style of the sushi rice: in this case it was quite dry and little vinegar is used. 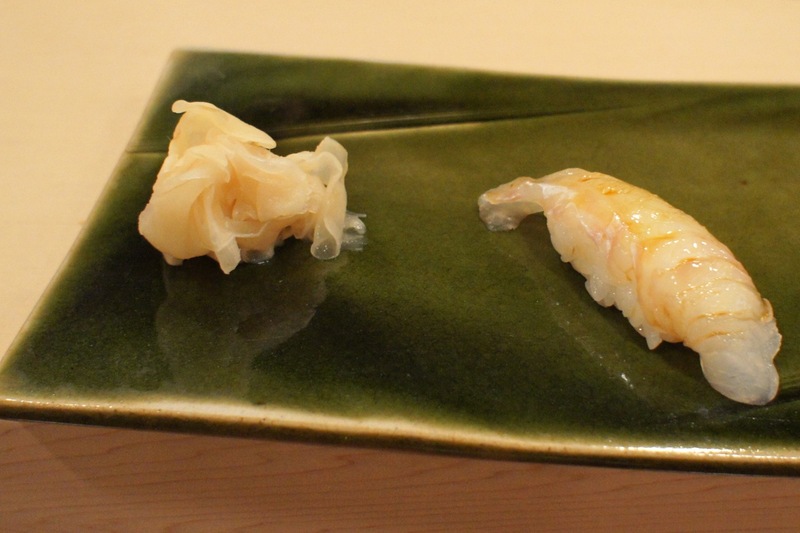 My wife prefers this to the other style where the rice tends to be more moist with vinegar (like at Sushi Harada and Sukiyabashi Jiro Roppongi). 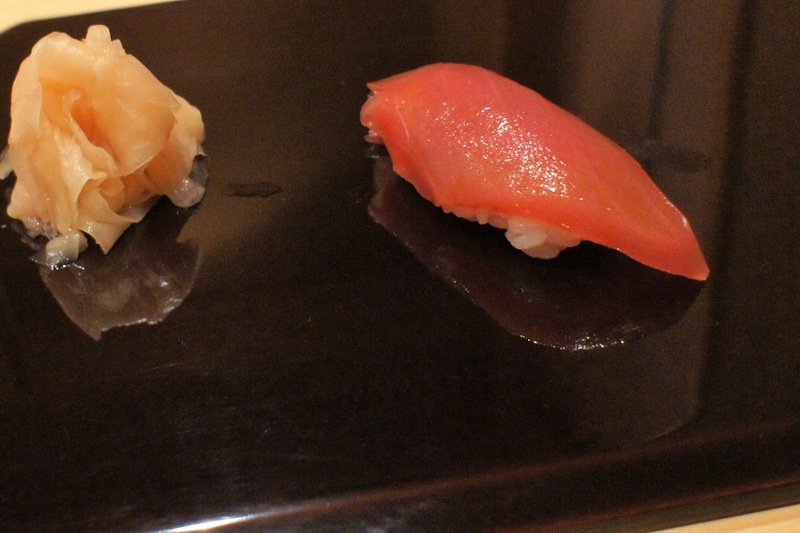 The sushi as you can imagine, was excellent. Each of us had a wet towel nicely folded just at the base of the sushi tray for us to clean our fingers after picking up the sushi with our hands (yes it is acceptable to use our fingers to pick up the sushi (not sashimi or anything else though) in case we weren't that proficient with the chopsticks). 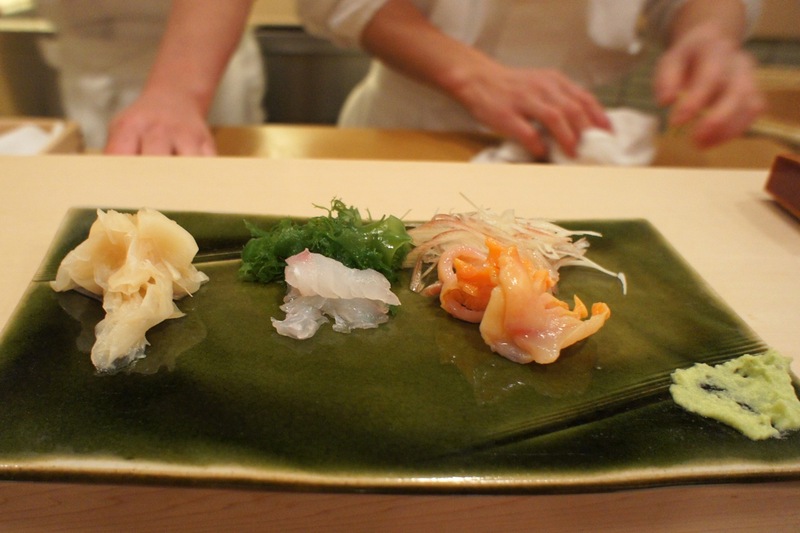 Meals at sushi restaurants can sometimes end abruptly, and you'll realise that the meal is over when the chef stops serving any more food after a few minutes; there is no dessert or the like to end the meal. The more polite chefs (like the one here) would ask if we were full (as a hint to us that dinner was over). 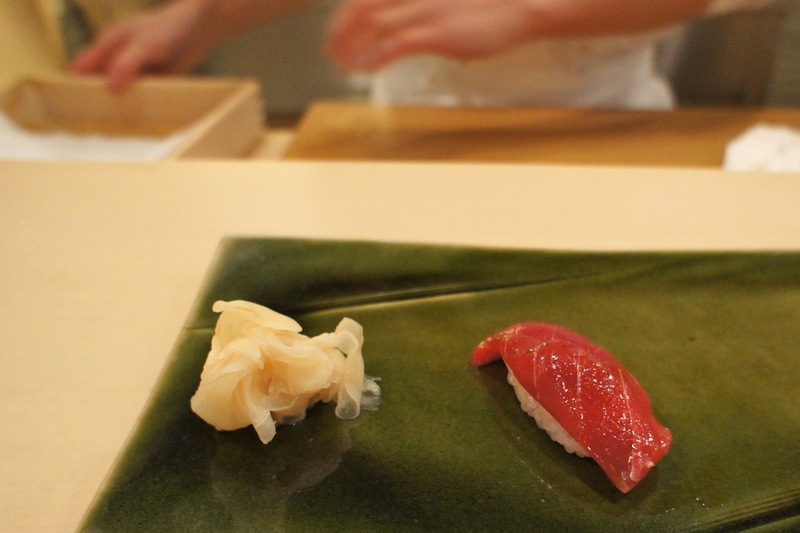 Once, we dined at a similarly high-end sushi restaurant in Ginza in 2009, and we sat there stupidly for more than 30 minutes waiting for dessert or some other food, before finally realising that our meal was over and that we should ask for the bill. 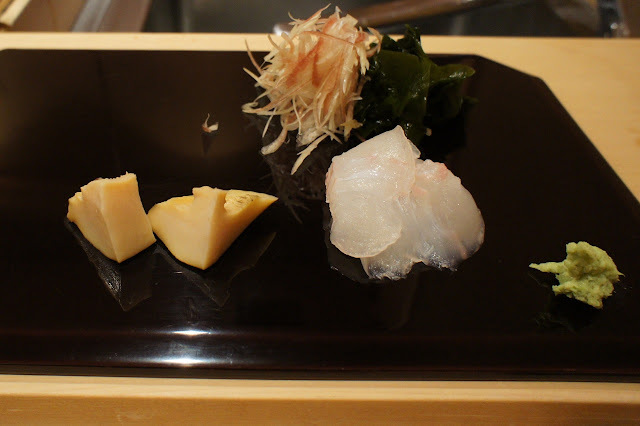 It was an excellent meal, distinct from Sushi Harada in that the meal here was more structured and felt more high end (the chef at Sushi Harada was more instinctive and would alternate between sashimi, sushi and cooked food whenever he thinks of something good for us to eat). Sushi dining at its finest. 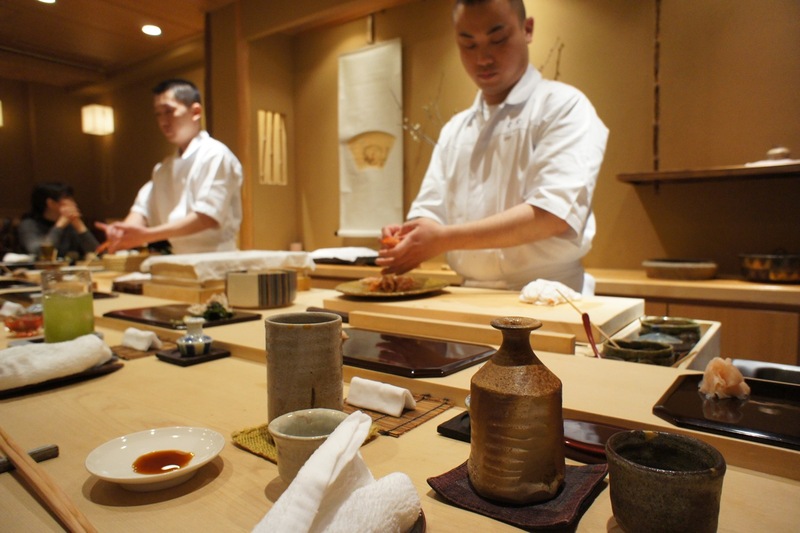 Ukai-Teh is a 1-Michelin star teppanyaki restaurant in the Ginza area of Tokyo. 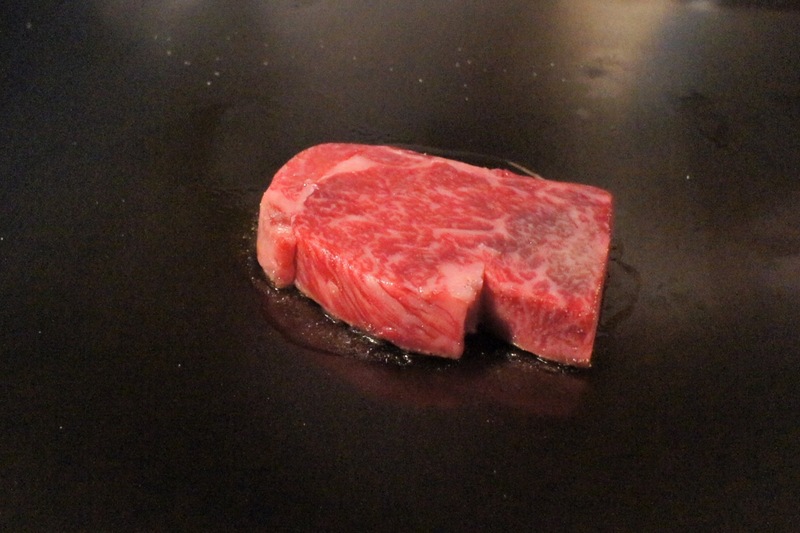 Strangely, there are only 2 teppanyaki restaurants which have been awarded stars by Michelin, and both are Ukai-Teh restaurants (the other one is at Omotesando). In traditional style, it has various sitting areas, from the reception area where we were served ginger tea, then we were led to the teppanyaki counter, and after lunch, we were brought to a lounge where we had our coffee and desserts. 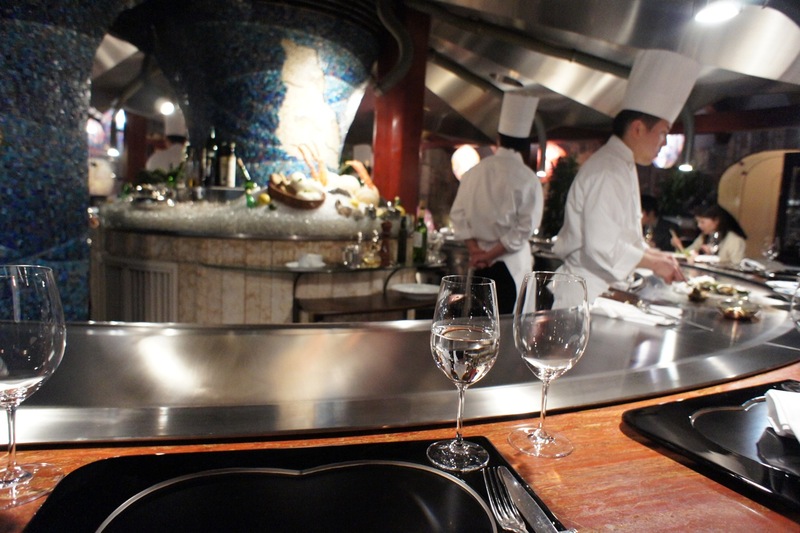 The teppanyaki counter was a large circular counter which allowed for guests to be seated away from each other yet made it easy for the chefs to serve us. 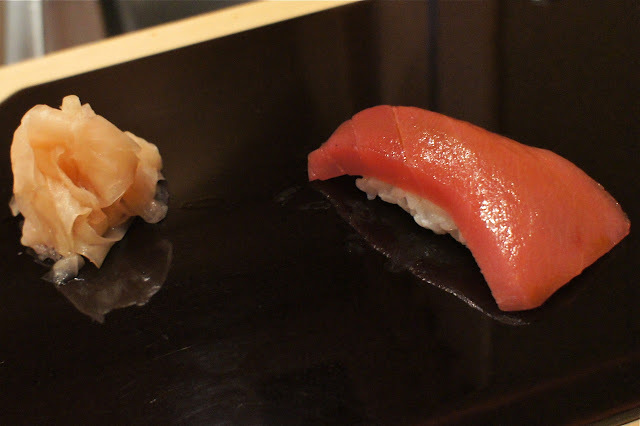 Despite the heavy dinner we had last night, we went for the full dinner menu (though it was lunchtime) in order that we could taste the best they had to offer. The wine list was quite short but looked reasonably priced, and we picked out a 2006 Domaine de la Janasse Chateauneuf du Pape which was a sensible Shiraz to go with the beef. 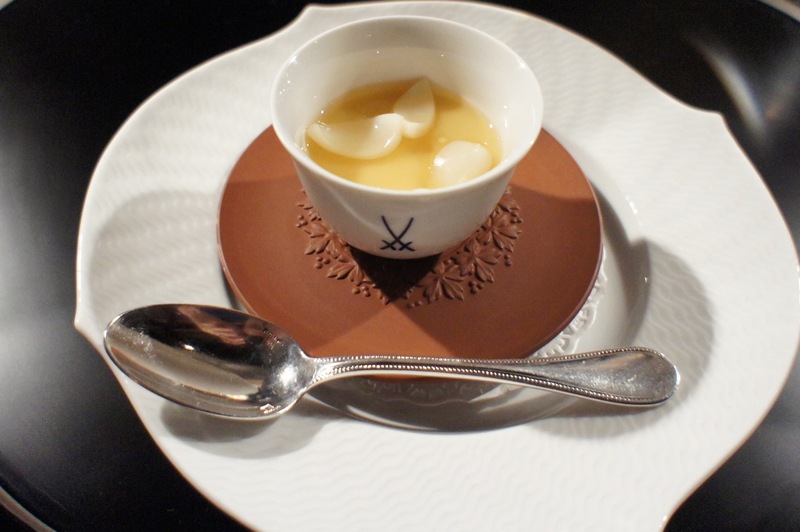 The meal started an amuse bouche of egg custard (chawanmushi) with truffle oil and garlic cloves. 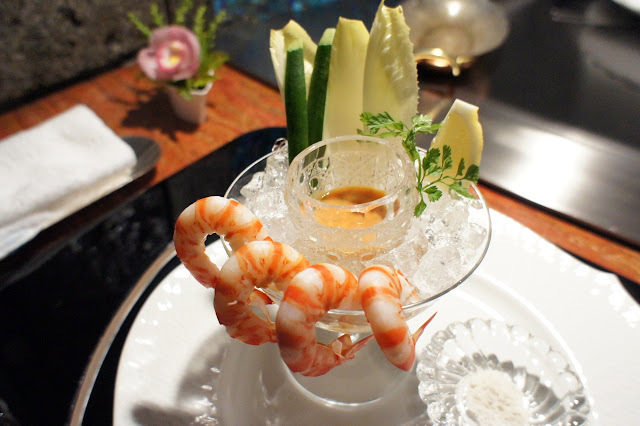 For our entrees, my wife had the shrimp salad while I had the scallop with foie gras and truffle sauce (which was really filling). 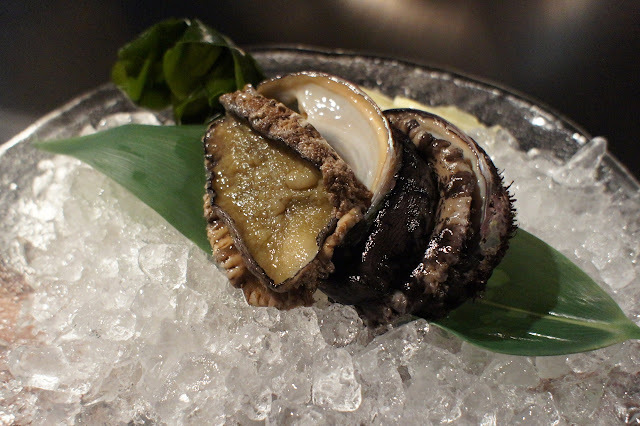 The first teppanyaki dish was the abalone. 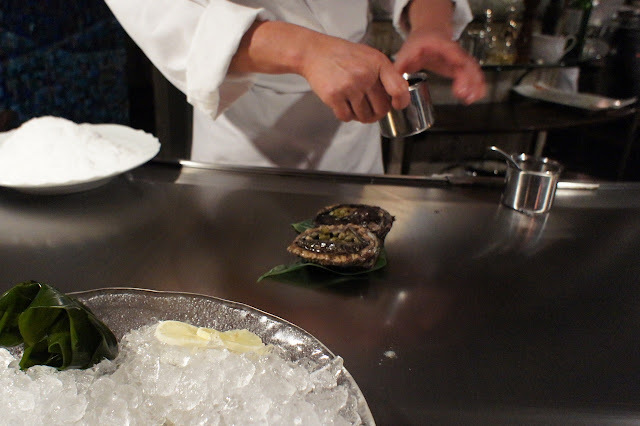 The chef brought the live abalones out on a bowl of ice. We were surprised with how 'live' it was, as both abalones tried to climb their way out of the bowl (we felt a bit sorry for them). 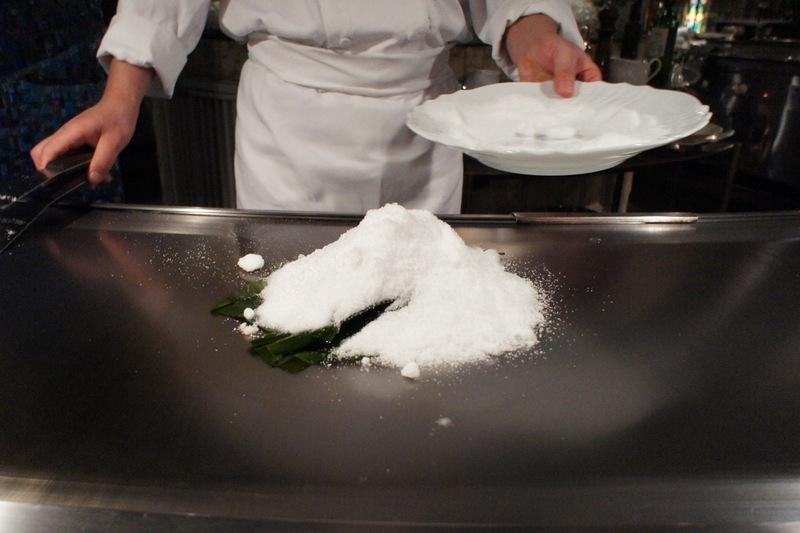 Unfortunately for them, the chef tossed them both on the teppanyaki hot counter and covered them with a heap of sea-salt. 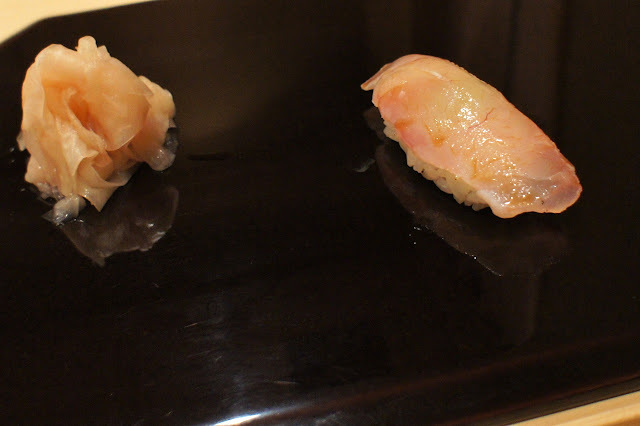 They were then both covered and left to cook for a while. 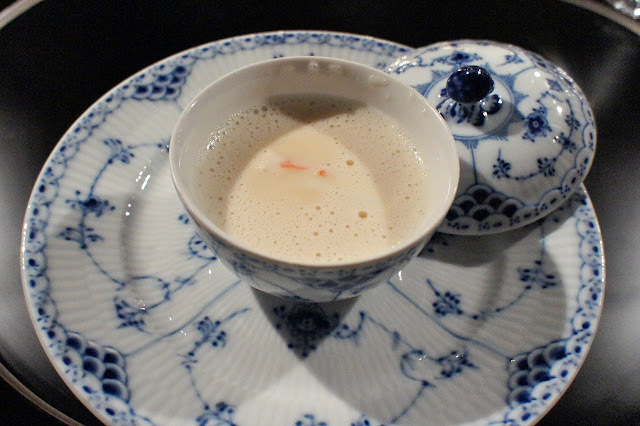 In the meantime, we were served with the king crab bisque which was very delicious and had large chunks of crab meat. 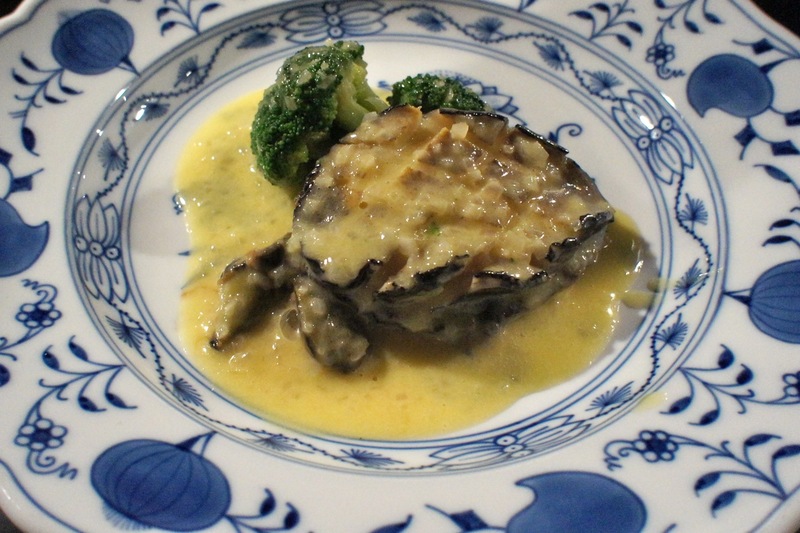 The abalone was ready to be served and it was garnished with broccoli and saffron butter sauce. 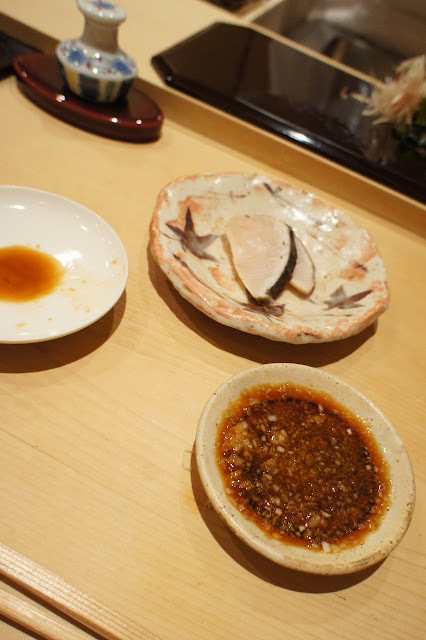 The huge abalone was very fresh (as was to be expected) but we felt that the butter sauce was too heavy. 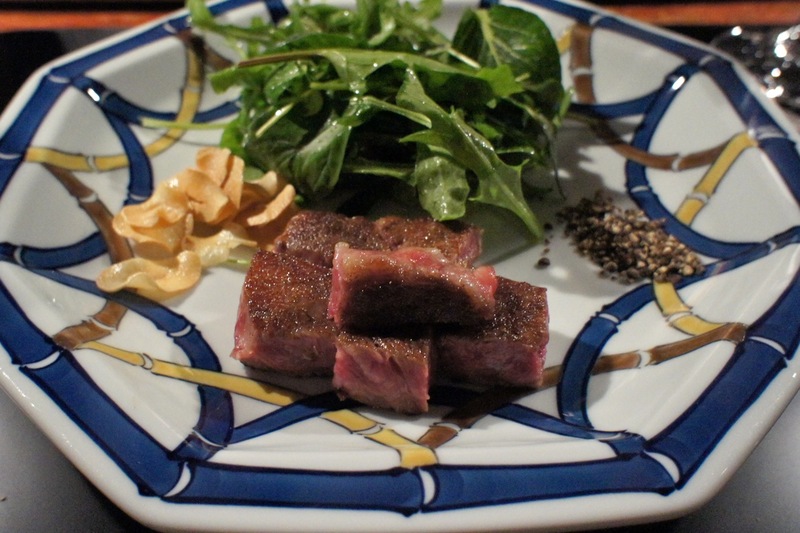 Then the main attraction for lunch: the Kobe beef, served with garlic chips and salad. It's as good as it gets. 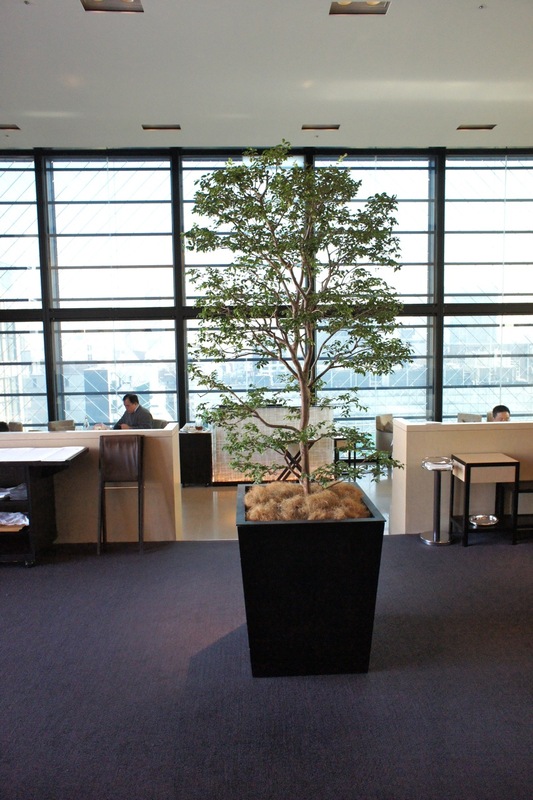 After our main courses, we were led to the lounge area where we had the choice of dessert. 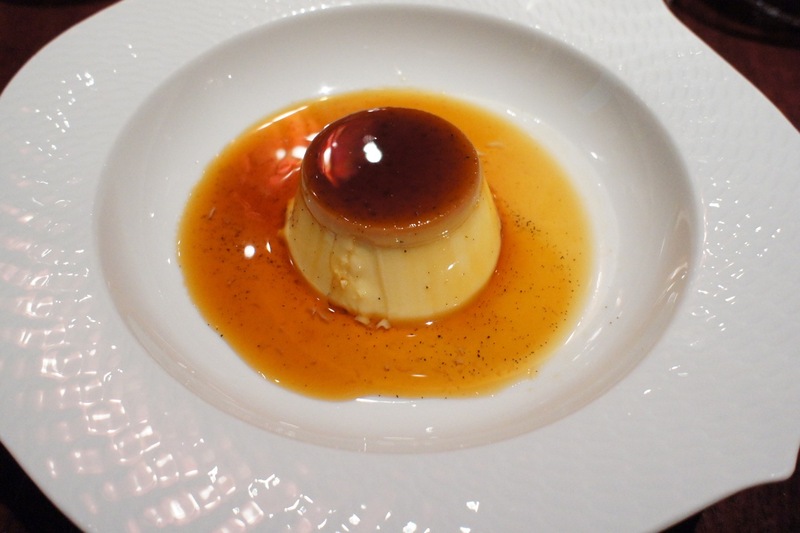 My wife went for the creme caramel while I had the fresh strawberry with yoghurt. 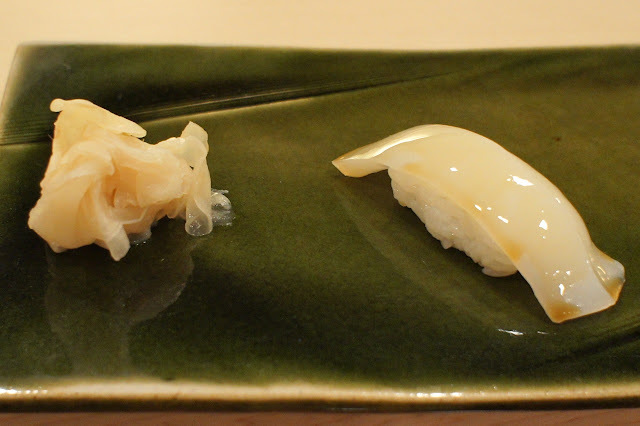 Both were very refreshing after a heavy lunch and a bottle of wine. 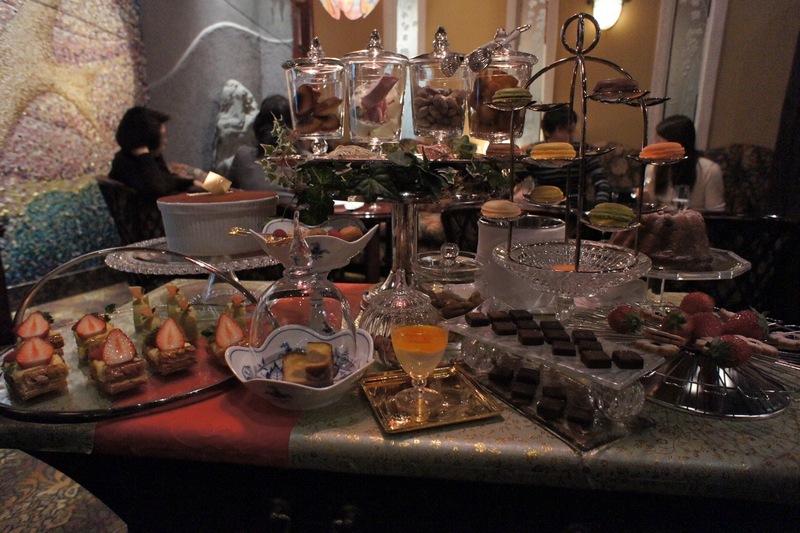 This was followed by the dessert trolley from which we picked out some more desserts and sweets. 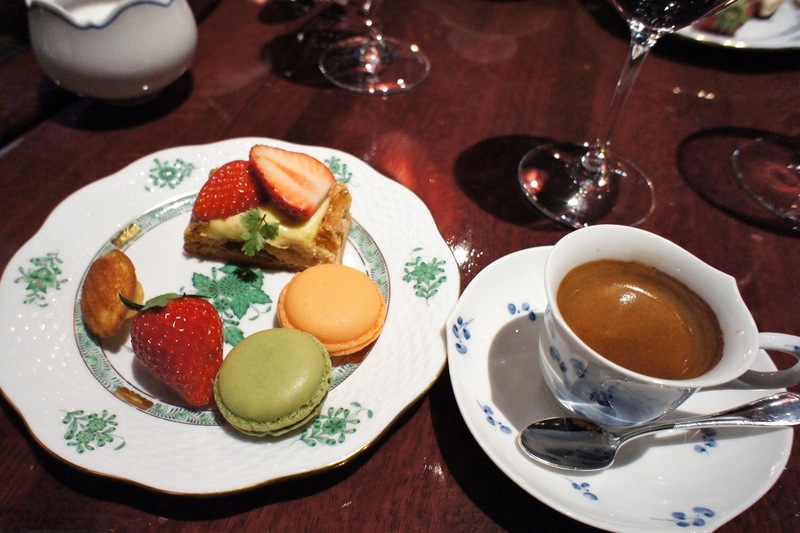 We were served these with some coffee. It was a very good lunch, and definitely worth a visit to satisfy a craving for great Wagyu teppanyaki-style.